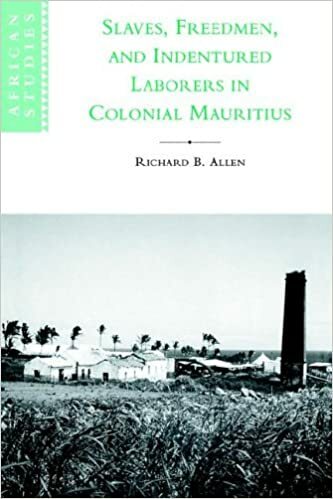 This social and economic history of the island of Mauritius, from French colonization in 1721 to the beginnings of modern political life in the mid-1930s, emphasizes the importance of domestic capital formation, particularly in the sugar industry. Describing changing relationships among different elements in the society, slave, free and maroon, and East Indian indentured populations, it shows how these were conditioned by demographic changes, world markets, and local institutions. It brings the Mauritian case to the attention of scholars engaged in the comparative study of slavery and plantation systems. date to the 1770s. Notarial acts from this era indicate that the pattern of these private purchases was much the same as it had been for their acquisition of public lands; transactions involving small plots in the colony's urban areas, and especially in Port Louis, outnumbered those involving larger rural tracts by a substantial margin. This activity continued on a rather modest scale until the 1790s when the number of private transactions involving gens de couleur began to increase dramatically.